Christmas and New Years are approaching, and we’re deep in many, many projects as we try to finalise everything ready for 2019. So, in between the running around, the fittings, the stitching and the 394723 cups of coffee that are currently being consumed, we’ve been reflecting on this whirlwind of a year. There has been plenty of new ranges released, projects of all sizes, and a few milestones that we’ve hit. We’ve been nothing but busy – no different to any other year! But we’ve loved seeing our designs come to life and hearing the incredible feedback from our customers. The biggest project we completed this year was Carbis Bay Beach Lodges. We made and installed the window treatments and soft furnishings for all eight lodges, which are situated right on the beach. The window treatments included pencil pleat curtains, black-out lined and hung on Silent Gliss tracks, and motorised blinds for a roof window. Furthermore, headboards and window seats were created to match the soft furnishings and bed throws that we supplied. Another project that stood out for us is the Treehouses for the Fish Hotel. These treehouses offer a unique form of accommodation that blend the joys of camping in the woods with the luxuries of a boutique hotel. We designed the window treatments and soft furnishings, including the seat and back cushions for the bespoke L-shaped sofa. Our commercial projects aren’t the only jobs that we are proud of. We completed many renovations for residential interiors as well, including this cinema room, Scandi-style sitting room, and this house in Coleford. One of our biggest retail jobs was this Georgian townhouse, in which we supplied the furniture, lighting and created the soft furnishings for this bold, contemporary home. We also fashioned a range of window treatments, including pelmets and blinds. We worked on most of the rooms in the house, creating a beautiful home featuring floral prints and sumptuous fabrics - it was undoubtedly a unique and rememberable project. We work on many homes throughout the year, and if you’d like to stay up to date with our projects, follow us on Instagram, Facebook and Pinterest. We’ve also furthered our work with our partner business, The Clubhouse, Sling. After we assisted with its re-branding, we’ve continued with our redevelopment by adding a children’s playroom, using murals by Villa Nova Picturebook, football changing rooms and a room for Pilates. We are making this into the ideal community hub for the village and a meeting point for many activities that anyone can join. It isn’t just our projects that serve as a highlight for us. In September, our new website was launched, featuring our portfolio, this blog and some of our testimonials. We also added a Christmas page this month, featuring gift ideas and tree accessories. We worked with Dapper Designs to create the perfect website to show off our business, and judging by the feedback we’ve done just that. As of the day this blog was written, our portfolio is our most popular page, meaning that our clients are intrigued by what we’ve done and hopefully love our work as much as we do. More will be added as we continue through our projects, so you don’t miss out on anything exciting. Big thanks to Dapper Designs for working with us. 2018 was also an exciting year in terms of our fabric suppliers, as many stunning collections were introduced. One of our favourites was Romo Rugs, Romo’s first rug collection. This consisted of beautiful rugs made with some of their most popular designs. The range included a mix of either hand tufted or flat weaves, and come in different sizes. The samples are available from our showroom, and are perfect for those wanting a contemporary feature in their home. Check out our blog post on the range here. Villa Nova’s Picturebook was also a highlight, as you probably already know. This whimsical range was a big hit in the interior world, full of animals and vibrant landscapes. Villa Nova worked with three illustrators to design the prints for this collection, creating lots of cute animals and detailed, intricate scenes. Complete with wall stickers and fun accessories, this collection will add a bright and playful addition to your home. For more information on this range, click here. A few of our designers also attended Decorex and Design Centre this year, based in London. This is one of the most significant interior design events of the year, featuring major brands and suppliers, including Osborne & Little, Colefax & Fowler and Designers Guild. Our designers saw the latest trends that were on display, found inspiration amongst the beautiful stands and previews of ranges that were soon to be released. If you would like to know more of what they saw, take a look here. Finally, we saw the development of our new home – the Lambsquay. We revealed this year that we are relocating there next year, and, even though there is still lots to do, we are very excited to see what it will look like once it’s finished. 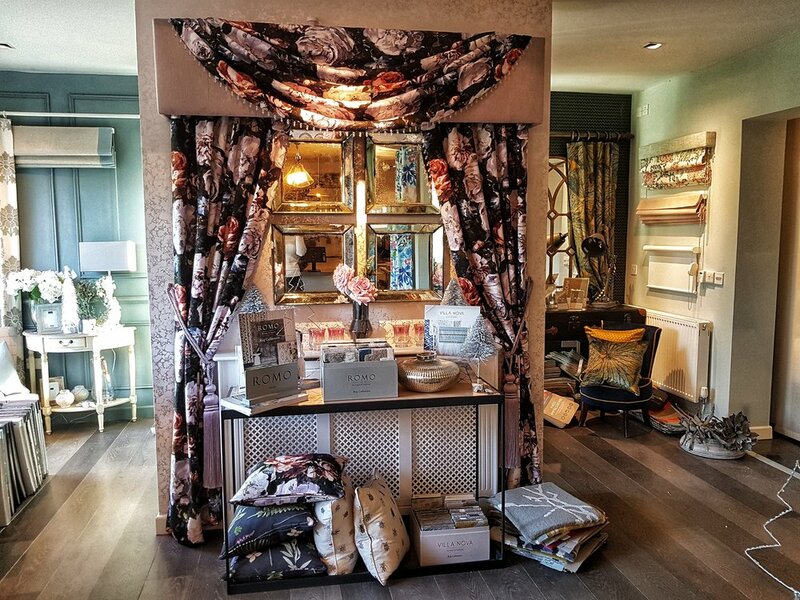 If you are yet to see our current showroom, take a look at here if you’d like a sneak peak. So many things have happened this past year, and there is much more to come. We are always busy here at Calico; no one has any idea what project they will be working on next. And so, we want to thank all who have supported us over the years, our customers, our suppliers, and every member of our staff for working their hardest to ensure that our projects are completed to the highest standard. We hope you all have a spectacular Christmas, and a happy new year.